Fall. A change of season can sometimes take on a change in life. Kids are in the routine of school, weather has cooled off, trees are losing their leaves after the brilliant show they gave earlier on in Fall. It's easy to become distracted and disappointed as we look towards the end of a year, and the start of a new one. Many times we are apart from our loved ones over the holidays, and we don't know what to do with ourselves. Depression can set in. Some of us are facing larger obstacles, such as health issues, and the uncertainty of aging. Perhaps we have recently lost a friend, or a spouse, or a parent. The holidays are before us and we don't know what they will hold as we face them alone. If you are in Jesus Christ and your heart is committed to God's plan for your life, it means that today is your best day. It's not your best day because you feel like it is, or because you pretend that it is. It is not your best day because everything is going perfectly, or because you are living in ideal circumstances. It is not your best day because you are in optimum health, or because everything is going your way. 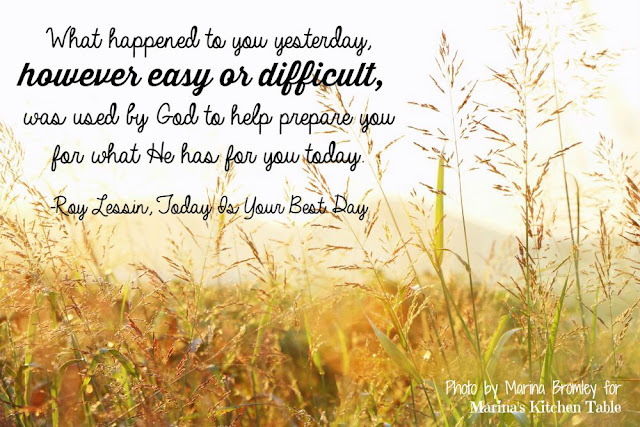 What happened to you yesterday, however easy or difficult, was used by God to help prepare you for what He has for you today. Today is your best day because you can grow a little more in your faith, a little more in your maturity, and a little more in your intimacy with Jesus. Today you can take another step higher as He takes you from glory to glory; take another step deeper as you grow in His love; take another step farther as you obediently walk with Him. Today is your best day because it has brought you one day closer to the coming of the Lord. You may be going through a very difficult time today, but that does not mean this is your worst day. God will use the difficulty to produce precious things within you that you will treasure in days to come. There may be pressures in your day, but God uses pressures to form diamonds. There may be a fiery trial in your day, but God uses fire to purify gold. There may be an irritant in your day, but God uses irritants to create pearls. If you are in need of comfort today, God will bring His comfort to you, and the comfort you receive will help you comfort someone else tomorrow. Corrie ten Boom once said, "God doesn't have problems. He only has plans." God doesn't make bad days for you and good days for you. God makes each day fit perfectly into His plans for you. He made this day so you could glorify Him. He made this day so that He could draw you closer to His heart. He made this day so that you could see your life from faith's point of view.